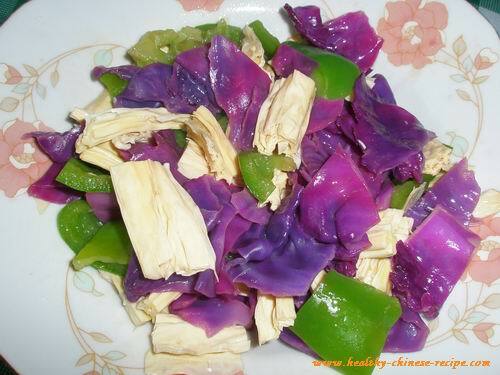 This Stir Fried Red Cabbage and Green Pepper is a quick, easy and simple Chinese dish. It's good to be served in winter, especially those who always feel cold and cannot eat raw food. It's also vegetarian or vegan recipe. Anybody can eat. You can take out tofu if you don't have on hand. Another picture is the I made with tofu skin. It's more tender. 1. Wash red cabbage layers, cut into strips. Clean green pepper, remove seeds, cut into strips. Cut dried tofu into strips. 2. Heat oil in a wok. Add Seasoning, sway the wok, let the fragrance come out. 3. 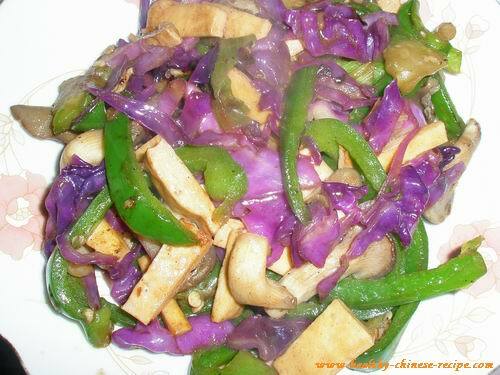 Add tofu, cabbage and green pepper strips, stir fry quickly till color turned. 4. Add Sauce, stir fry till coated and thicken. 5. Turn off heat, arrange on a plate. Serve with steamed rice.